Just place one pack into your bag, jar or container, and Boveda will do the rest. Your bud will be revived with moisture in 1-3 days in any container. You can’t underdo it or overdo it – Boveda will maintain the perfect humidity within your container, so there is no risk of mold and your bud will retain its potency, aroma and smokeability wherever you take it. 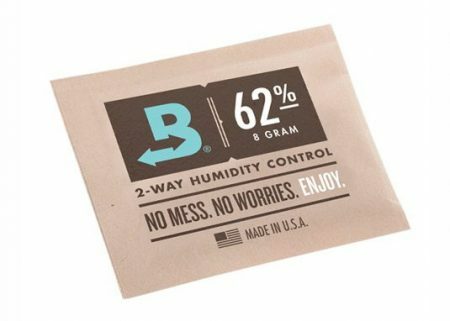 Boveda is scientifically engineered to maintain a precise relative humidity in an enclosed space. One 8g Boveda pack will freshen up and rehydrate up to 1/2 oz (14 grams) of bud and store up to 1 oz (28 grams) of flower. Having never even heard of Boveda until i received two packs with the Electric Sky 300’a I purchased . I must say that this stuff works GREAT ! It does exactly what it says . Keeps your smoke at the exact right moisture level for curing as well as for smoking . Excellent product !